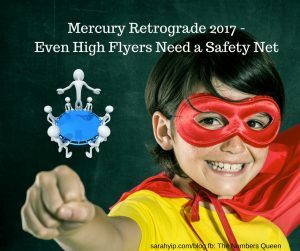 Home11:11Mercury Retrograde 2018 and 2017 – Even High Flyers Need A Safety Net! Mercury retrograde doesn’t have to be a scary astrological event. As much as it’s associated with travel delays, impulsive decision-making, conflict and technology fails, it’s also a fantastic time for renewal and inner healing. The analogy I use is a stocktake sale – Mercury retrograde is the calm after the storm – a slowdown that occurs every few months, to make sure we’re doing what’s good for us. It’s only after a sale, that business owners know which products are profitable, and which they should dump. Similarly, Mercury retrograde gives us a chance to reconnect with positive people and habits, while releasing the ‘energy vampires’ in our life. It shines a spotlight on how we’re really going (underneath our smiles), and forces us to confront whether our lives are balanced. It’s like a quarterly life review. 2 or 3 December 2017 – 22 or 23 December 2017 (in Sagittarius)Notes: I recommend marking these dates in your phone. The start and end windows can vary by a day, depending on where you live. Check astrology sites for more specific info. Sensitive people (e.g. psychics like myself) often feel a Mercury retrograde a few weeks before and after it starts or ends. This is called the ‘shadow’ period.As you can see, there are four Mercury retrogrades a year, so there’s no point hiding under a rock every time one strikes. However, it’s prudent to plan around them. Don’t believe me? I challenge you to look back on the 2016 events (dates are in this post) – and see if there’s a pattern of delays or not. Who’s most affected by Mercury retrograde? Anyone with strong Gemini or Virgo astrology. I also find that lifepath 5’s in numerology, or those with strong 5 energy in their birthdays. are highly impacted – if you see repeating 555’s on clocks etc. this could be you). I’ve also heard it said that if you’re born under a Mercury retrograde, it’s not as frustrating to navigate. My friend and crystal healer Deniz Akan from Dimensional Healing has corroborated this theory, she loves Mercury retrogrades and finds them liberating. Find your lifepath using numerology. You don’t need a parachute unless you’re jumping out of a plane. Similarly, you don’t need to meditate, exercise, change your diet, water supply or seek healing unless you’re craving radical progress and upgrades. Due to the nature of my business (including my prices and career background), I attract high achievers, business owners and leaders. Over the years, I’ve noticed that, the more successful someone is, the more they protect their energy.Just as a change in coach can help an athlete win a gold medal, it’s essential to keep trustworthy people around you, especially if you’re in a competitive industry. As a professional numerologist in Brisbane, I’ve learned that people with Master 11/2, 22/4 and 33/6 numerology need the most support (and strongest safety nets) to live up to their ‘double potential’.Otherwise, they tend to drift along at their simpler vibration (e.g. a Master 11 lifepath will act as a 2 lifepath, i.e. a behind-the-scenes co-ordinator rather than a spiritual messenger). Although this is still helping humanity, it can also lead to resentment (think of Superman losing his cape at the dry cleaners…) Ironically, Master number holders tend to be controlling and quite stubborn. Due to early life struggles, they prefer to rescue people, and to give help rather than to receive it. This sets up a karmic imbalance, which can lead to burnout in their 20’s or 30’s. The sooner they realise there’s ‘strength in numbers’, and value in public or group work, the faster they reach their goals. Remember that, a good leader creates leaders, not followers. That means teaching people to be inter-dependent, not co-dependent or overly independent.Trust me, I’m a Master 11 lifepath, who knows what she’s talking about. My career is proof that ‘the master has failed more times than the beginner has even tried’. It took me thousands of psychic readings to convince myself I was genuine. Find your lifepath.The same goes for people who see 11:11, 111, 222, 333 and other repeating numbers – you’re in a 5 to 9 year shift and now is the time the invest in your happiness. You don’t want to miss this incredible portal for love. Don’t be surprised if you’re going through major breakdowns and breakthroughs in all areas of life – your Soul is literally cleansing you of baggage, so you can ‘take flight’ and move into a career/ relationship/ spiritual lifestyle that gives you wings. See my latest Angel Meditation for an instant energy boost and connection to your Guides. No one wakes up happy every day, and it’s your habits when you’re ‘down’ which determine how quickly you bounce back. That’s why I recommend the following process for keeping yourself on track. The goal: To create a visual reminder of what keeps you healthy and well in life, including the warning signs that occur when you are too stressed. What we focus on, increases – using this checklist can help you to stay centred, literally (the central row is your ‘happy place’. It’s like a spiritual first aid chart. You can use more images and less words if you like – see my post on Vision Boards.1) Using pen and paper, or your computer, create a table with four columns: Mind/ Body/ Emotions/ Spirit (yes, it will look like 11:11!) Divide each column into five rows: Too much/ Ideas/ Just right/ Ideas/ Too little (see example). Getting through to-do list easily at work and home. 3) Stick this table up where you can see it in the mornings. Each day, when you wake up, go through the four columns one by one. Do a check of whether you’re in the ‘too much’, ‘just right’, or ‘too little’ zone. An accurate diagnosis can be 90% of the cure! 4) If you notice you’re constantly in the ‘too much’ or ‘too little’ categories for a particular column, take urgent action to restore sanity in that area. Although some of my ‘ideas’ may look silly, all I can say is, they work for me! 5) Regularly update your sanity checklist, say every Mercury retrograde. It’s meant to be a living document. Oh, and remember to celebrate your achievements! I hope you’ve enjoyed this alternative look at Mercury retrograde, and practical outline of how to keep yourself whole during stressful times. Wishing you a safe, nurturing and joyful Mercury Retrograde season. Super happy to hear your feedback Kerri-Anne. Please check out my 11 lifepath info, very glad to have connected. Best wishes with the light work. Glad to assist Garry, really appreciate your support. Makes it all worthwhile.